A senior Orangeman has said the family of tragic budding mechanic Neil Graham are “in our thoughts and prayers every hour of every day”, adding that a major parade this weekend has been put off as a result of the death. 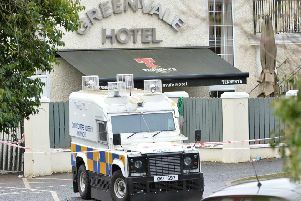 Stuart Brooker, the county grand master of Fermanagh, told the News Letter that he had had paid a visit to the “distraught” family in the wake of the tragedy, which has “touched the county”. The Grahams have strong Orange Order links; Neil’s father Eddie is district master of No15 District, Garrison, and Neil’s brother Jonathan is also a member of the institution. Neil himself, who was aged 17, was expected to follow them into the order shortly – an ambition which was cut short by his death in a mechanical accident on Tuesday. He had been on work experience at a garage to the west of Enniskillen when it is understood a tractor part fell on him as the vehicle was being repaired. He died at the scene. The engineering student was the youngest of four siblings, and had a girlfriend. Mr Brooker said that a planned parade for this Sunday in Enniskillen has now been deferred until later in the year “as a mark of respect”. The parade, now in its 10th year, is to honour brethren who have been killed, and has “grown and grown” over the years to involve upwards of 1,000 marchers. He said it is now likely that the event will be held in September, after the main parading season has died down. He told the News Letter: “I know his dad and mum very well, they’d be personal friends of ours. “It’s a very sad home, there’s no doubt about that. “It’s just really, really sad and it’s touched the county as a whole. Because of the Orange connections, it’s really touched everybody, everybody is really upset. “We really feel for the family. Their grief is just unimaginable. We’re very much with them. In today’s News Letter, Neil’s mother Joy had described him as a “caring” and “loving” boy who had “everything going for him”. His funeral service is set to be held on Friday at 2pm in Garrison Parish Church, Church of Ireland. He is to be buried in the adjoining churchyard afterwards.